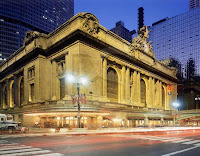 For any Cheapos out there who might find themselves in Manhattan on a Friday afternoon, there is a great walking tour of Grand Central Terminal and its neighborhood. Sponsored by www.nyc.com, this free, ninety-minute visit is well worth the time and, of course, you can’t beat the price! The tour section of the website indicated that we should meet at 12:30 p.m. “in the sculpture court at 120 Park Avenue.” However, the sculpture court itself had been moved a few years beforehand, which left us wondering if we were in the right place. But, sure enough, at about a quarter past noon, our guide, Peter, showed up along with about a hundred prospective visitors. Luckily a few minutes later, another guide arrived so that the group could be divided in two. 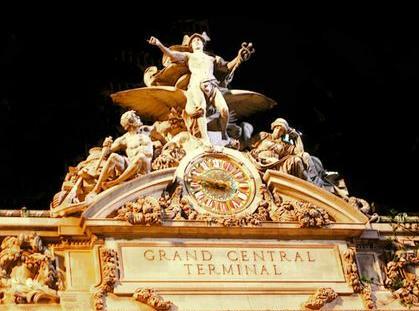 When it opened in February 1913, the beautiful station was termed “the newest jewel in New York City’s crown” by the Times. “Buildings speak,” as Peter kept telling us, and this edifice at certain points tells us to hurry by having ramps instead of stairs and low-ceilinged corridors which discourage dallying. But the height and roominess of the main concourse encourages the 500,000 or so people who pass through there each day to pause and look around at other travelers and the architecture, including lovely staircases fashioned after the Garnier Opera House in Paris. A recent twelve-year restoration has brightened up the astronomical chart ceiling, tarnished by decades of cigarette smoke and other pollutants. The restorers showed their humorous side by leaving a small rectangle uncleaned so that visitors could compare it with the work that they had done. 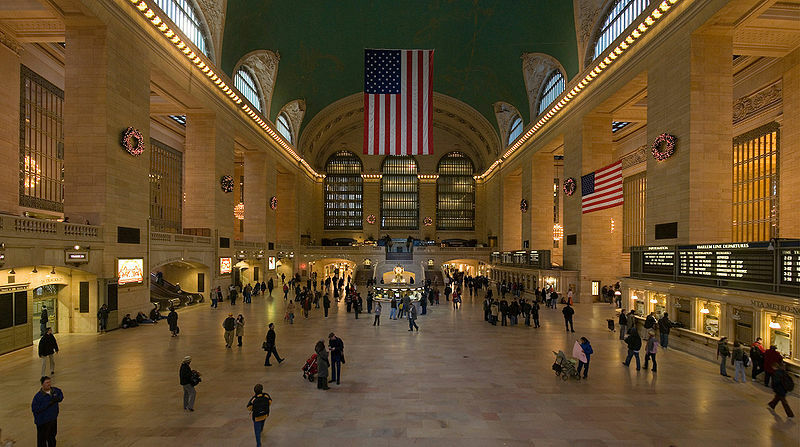 Today, the spacious main concourse, which could house several ten-story buildings, occupies some very valuable real estate. 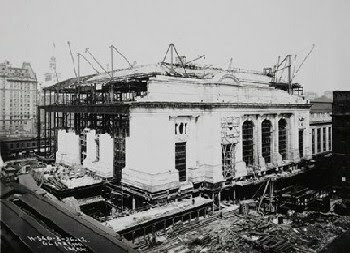 Fortunately, because of pressure by preservationists, Grand Central has escaped the fate of the old Penn Station which was destroyed in 1963. Our tour also took us upstairs to the famous living quarters of Connecticut resident John W. Campbell who served on New York Central’s board of directors. 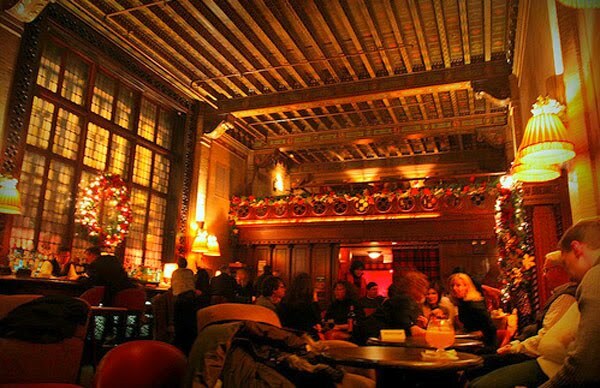 The “Campbell apartment," built to resemble a Florentine palace, now serves as a chic bar and lounge, open to the public. Please note that there are guidelines posted which indicate a dress code (e.g. no jeans or shorts), though we have no idea about its actual enforcement. 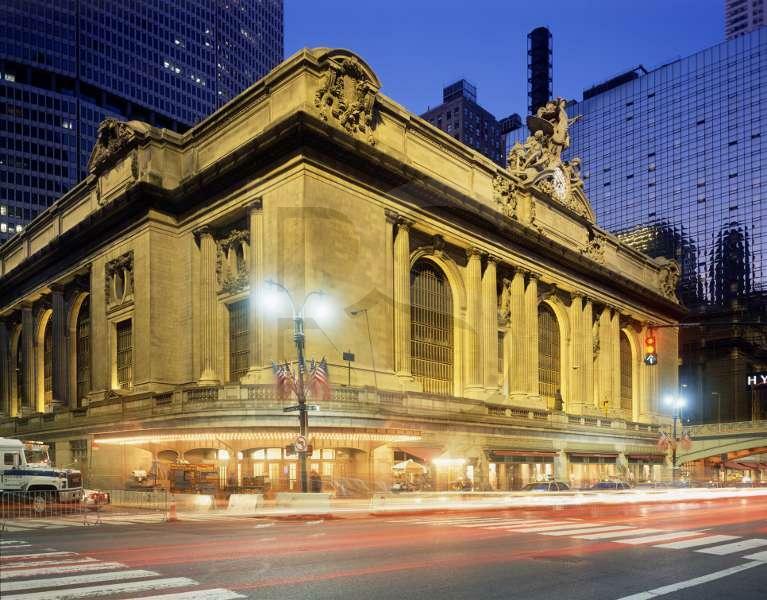 Anyone interested in architecture and the history of the railroad and the city would profit greatly from this informative Grand Central tour.